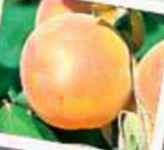 This small firm apricot is often canned whole. Excellent taste & quality fruits have golden skin with a red blush. Early ripening variety with vigorous and productive trees. Fruit is mid sized and has a bright orange color. Ripens late June. Hardy to USDA Zone 5. Pollinizer needed. Large yellow fruits with a red blush. Very productive. Especially good for drying and canning. Self fruitful. Early ripening type with large oval light orange fruit with a red blush. Smooth texture, low acid and has a mild flavor. Ripens mid July. Hardy to USDA Zone 5. Pollinizer needed (will not pollinate Goldrich). Excellent variety for canning or drying with a distinctive flavor. Fruit is medium to small and golden yellow with a dark red blush. Self-fruitful. Hardy to -30F (-34.4C). Self fruitful - No pollinizer needed.